This entry was posted in Managing risks & hazards on 2018/10/03 by Susan. Using explosives to blast trees that are too dangerous to fall by conventional methods helps keep fallers away from the hazard. Dave “Dazy” Weymer trains certified fallers to blast trees that are too dangerous to remove by conventional methods. He’s worked in forestry for more than 50 years, starting with rigging and hauling. Later, he worked as a faller, then moved into faller supervision, and eventually into blasting. “My dad was a logger. His dad was a logger. 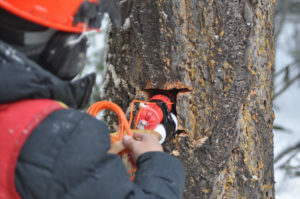 I was sort of born into it,” Dazy said, when I called to ask him about his course: Dangerous Tree Blasting Training for Fallers. Since 2002, Dazy has trained more than 100 certified fallers to become certified faller blasters. Why blast a dangerous tree? Dazy added that other factors making dangerous trees hazardous include the lack of an adequate escape route or open area to fall the tree into. He went on to explain that several methods are used for blasting trees. In most cases, the faller/blaster uses a saw to cut a window (a square hole) in the tree, then places explosives in the window. If the tree is not safe to cut at all, the explosives can be taped onto the outside. With trees that are bigger in diameter, larger amounts of explosives are often placed under the roots. During Dazy’s three-day training course, fallers also learn about handling, storing, and transporting explosives in compliance with federal requirements. Once they complete the course, they can become certified blasters, after taking WorkSafeBC’s blasting exam and fulfilling competency requirements for blaster certification. 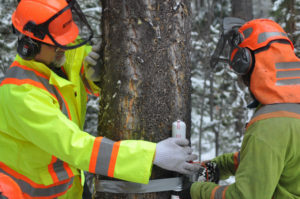 Read more about danger tree blasting in the BC Forest Safety Network’s June 2018 newsletter. To see how it’s done, watch the video below.